Danny Stewart marked his 500th Elite League game when he faced former club Coventry Blaze with Fife Flyers on Friday. The associate coach made the milestone appearance in a 2-1 overtime loss but was pleased to end the weekend with three points from a possible four. "We've picked up points against some good teams in recent weeks," said Stewart. "However it's important we find that way to win and play a solid 60 minutes." James Griffin's second period opener for Coventry was cancelled out by Bobby Chaumont in the third, but Rory Rawlyk clinched Blaze's win with the overtime decider. Flyers put that disappointment behind them to put the misery on Dundee Stars on Sunday, with a 5-3 win over Jeff Hutchins' men on Tayside. Matt Reber's early opener for the Flyers was cancelled out by Igor Gongalsky before Stewart's finish restored the lead. Rob Ricci levelled again with an effort early in the third before putting the Stars ahead, until Auger equalised. However, late goals from skipper Kyle Haines and Scott Fleming made sure of the win, consigning Dundee to another loss in a wretched campaign for them so far. Following their win in Kirkcaldy, Coventry moved on to Glasgow, but left with nothing as Braehead Clan went top of the table with a 4-2 win. Derek Roehl's opener was added to by Stefan Meyer then Jamie Fritsch as Ryan Finnerty's men threatened to run riot. Jereme Tendler pulled one back, only for Meyer to score his second to seal the win despite Cale Tanaka finding the net in the final minutes. Clan coach Finnerty spoke of his delight as his team went top of the Elite League for the first time in their history, but remains cautious. "It's pretty early to be talking beyond it, but it feels pretty good to be up there and we'll enjoy it for now," said Finnerty. "It's a happy dressing room, but we need to be realistic about where we're going - there's still lots of games to play." 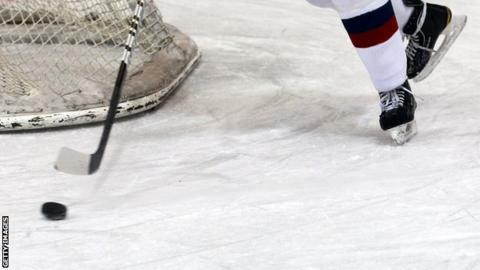 Coventry then returned to their Skydome base, where they defeated Edinburgh Capitals on penalty shots after a 2-2 draw. Tanaka scored to give Blaze the lead but Edinburgh recovered well to turn the deficit into a lead with Jordan Steel and Rene Jarolin finding the net. Ashley Tait levelled the game, which ultimately took the game to penalty shots to decide it and after 18 attempts each, Coventry's Jereme Tendler snared the winner. That came on the back of Capitals going down 2-0 at Hull Stingrays where Tanaka and Zach Hervato scored. Edinburgh are now seven games without a win and counting. As for Dundee Stars, their season lurches from bad to worse as they were left to reflect on another weekend of disappointment. Before their Sunday night loss to Fife, they began their weekend with a 5-1 defeat at Nottingham Panthers as the Tayside men continued to languish at the bottom of the table. Two David Clarke goals for Panthers set the tone, with Evan Mosey and Mike Berube adding to the tally in the middle period. Rob Ricci clawed one back for Dundee, but Nathan Robinson's late finish clinched the points for the English side. Add that loss to the Flyers and the Stars are really in a pickle so early in the season, with another double header with Fife and Nottingham to come.